8th Hole Summary: Usually plays downwind. The green is bunkered in front, right, and behind. The tough pin placements are left front. Some players elect to play this hole with a tee-shot to the right side away from trouble and then try to manage a two putt par. Comments: In this photo the blue tee markers are positioned at yardage of about 165. This tee extends back to the left. As well, the tee extends forward to the right. 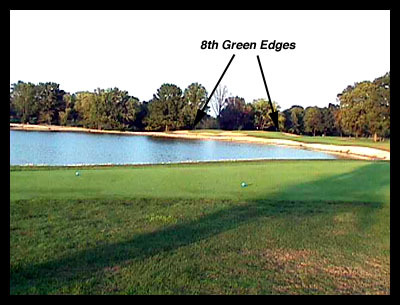 From the forward position there's little or no carry over the water to the green. This tee illustrates the high design quality found throughout the Scarlet Course: flexibility within a single hole that accomodates players of all skill levels.